A new client contacted us for a Las Vegas brochure printing project on July 3. 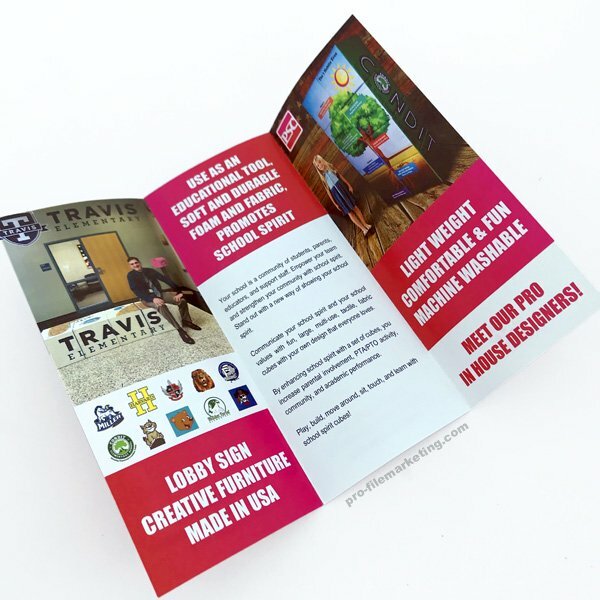 5000 full color tri-fold brochures for the upcoming trade show that was held at Sands Expo Center (Las Vegas, NV) on July 10th. We often run into this problem: customers feel that one calendar week is more than enough to start ordering the brochure, flyer, etc. One week is enough when you have all files 100% ready to go and there is no adjustments needed. This was not the case. The files for this brochure printing project were not even in process of being designed at that point. To make matters worse, the designer was located in Europe. July the 4th was on Wednesday, so there were only 2 business days left in a week for production. The brochures had to be delivered on Monday, July 9th. We stayed in touch with the client on July 4th to process the payment and assist his design team with art guidelines and templates. Although both are available online, we had no time for errors that would cause additional delays. The order was processed and ready to go. All we needed to start the production were the brochure print files. 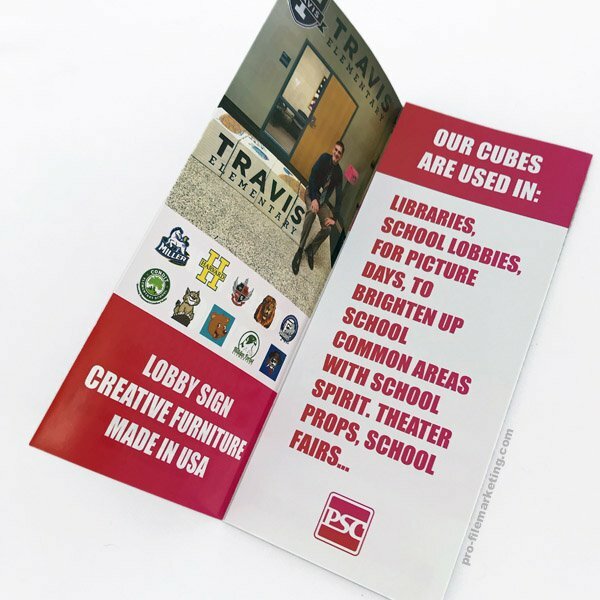 But we've noticed something that had to be fixed: part of the text in the center of the inside panel of the brochure was hard to read due to the wrong spacing / lead. Plus, the font within the paragraph was too large and aesthetically didn't quite work. 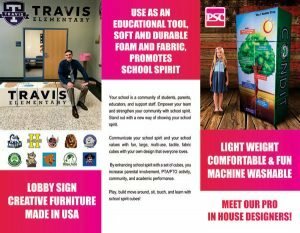 Although the customer was satisfied with the design that was provided by his designer, we suggested that this part of the brochure text must be changed. Unfortunately, at that point the customer couldn't contact the designer due to the time difference. Since the original file was a flattened TIFF, there was no easy way of changing the text. This means that we had to find a matching font, re-type, and set up the text with better spacing. Every time there is a change to the brochure file on our side, we must provide a client with an art proof to ensure it gets approved. The clock was ticking and there was less and less time left for printing the brochures. Luckily, the client approved the brochure design in a very timely manner and they were sent to production before the production cut-off of 10:00 am. This brochure printing project had to be produced with rush turnaround (2 business days). This is not the shortest turnaround we offer, but it worked best to meet the deadline. We know that exhibiting at a trade show is a stressful and often quite hectic time. That is why the drop off time and location is discussed with each individual customer in effort to make it as convenient as possible for them. The order was delivered to the Sands Convention center on Monday, July 9th to the drop-off area where we handed it in to the client. 5,000 tri-fold brochures fit into 4 somewhat small (approx. 9"x11.5"x13" tall), but very heavy boxes. Do you have a brochure printing project? 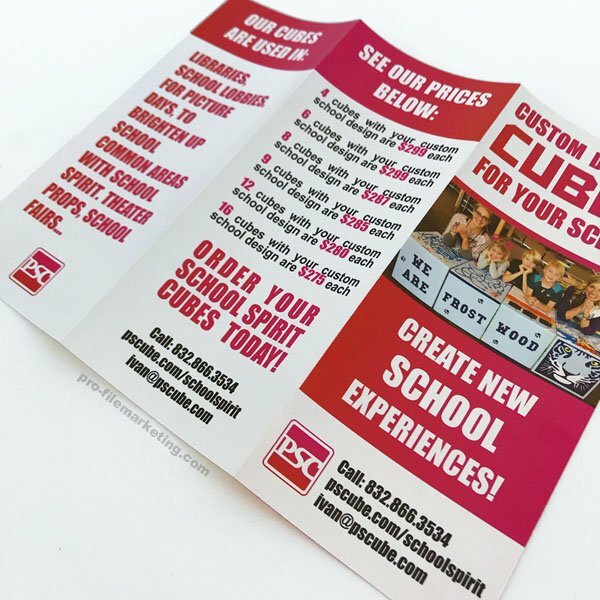 Order brochures online or Contact Us for special requests such as custom size, rush orders, or if you have any generic questions about the brochure printing. Although the summer has just begun, a new school year will be here before you know it. 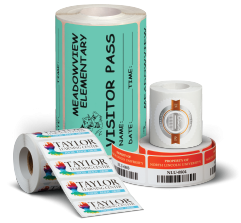 Now is the perfect time to deploy a branding strategy utilizing custom education labels and decals. 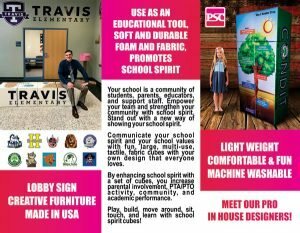 Stand out and attract new students, build school spirit, and plan ahead for fundraising events! 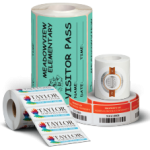 Pro-File Marketing offers a vast variety of custom labels for any type of applications and events, this can be even further customized with different options such as barcodes, variable content, and more. 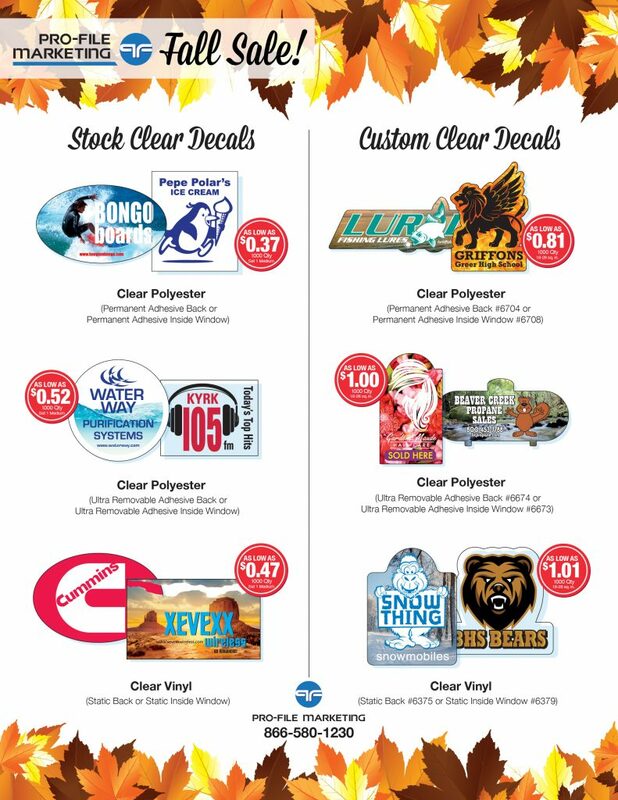 FALL SALE: Stock Clear Decals are now on sale!